Pictured below is Machinon, hopefully soon to be released industrial-grade hardware originating from a community project, and designed to manage home and small business automation with a Raspberry Pi. This smart home solution adds smart IO to a Raspberry Pi – 16 digital inputs, 16 digital outputs, and 8 analogue inputs. The digital inputs can be used as pulse counters (for kWh meters etc) or to detect status changes (doors opening and closing, buttons being pressed, motion sensors triggered etc). The analogue inputs (0 to 20mA, 4 to 20mA, and 0 to 10V input with 14bit resolution) can be used to measure currents and voltages, light levels, temperatures, and more. The digital outputs each supply up to 500mA which can be used to switch high voltage and high current appliances via a relay, or directly power low current low voltage devices. 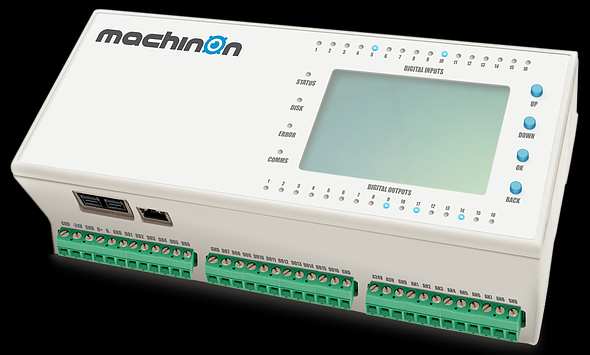 Machinon utilises two ATxmega microprocessors which take care of all the complex pulse counting, timing, analogue measuring, and data collection. The Raspberry Pi then simply communicates with Machinon via UART (serial port) to grab data and control and configure the smart IO. Machinon is designed to interface with many open source home automation software packages including Domoticz, openHAB, and HomeGenie so the overall user experience should be relatively simple. The price of this device is likely to be around £200 plus the cost of a Raspberry Pi and microSD card to go in it. Therefore, probably under £250 all in including delivery. For more information, click here to visit the Machinon website. 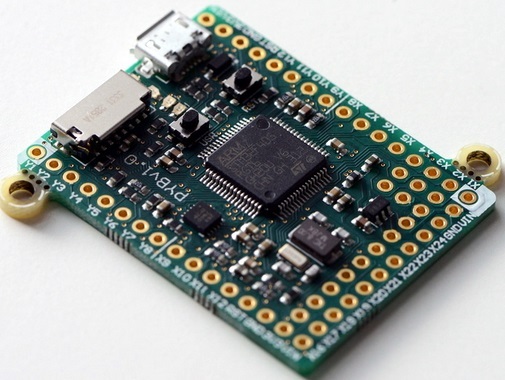 Spark Core is described as an Open Source IoT (Internet of Things)Toolkit. 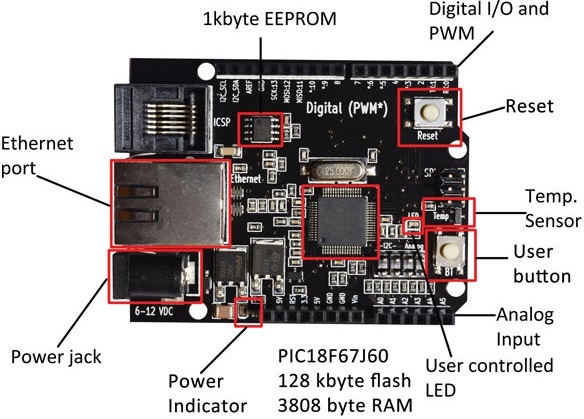 It is a small Wi-Fi development board which connects automatically to servers in the cloud, and can be programmed and controlled remotely over the internet and also send data to the cloud where you can access it. The Spark Core board is programmed using Wiring – the same programming language used with Arduino – but via a browser based IDE. Therefore you do not physically connect the board to your PC. Instead you just power it, it connects to your Wi-Fi automatically (with credentials entered during a one off setup process), and then automatically connects to the Spark servers. You then write your Wiring code in your web browser, it is checked and compiled on the Spark servers and the code is then flashed to your board over Wi-Fi and starts running. Each Spark Core has a unique device ID with an associated secret access code so no-one else can take over your Core or access the data from it. To try out Spark Core, we put together a very simple setup just to measure the ambient light level. 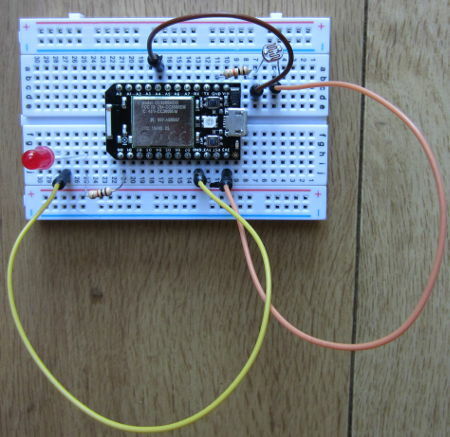 Spark Core is supplied with its own prototyping breadboard. We connected a light dependent resistor (LDR) to one of the regulated 3.3V output pins, and to one of the ground pins via a 10K resistor. This creates a voltage divider (where the LDR meets the resistor), the output of which we connected to analog pin A4. (In the photograph above, we also have an LED connected via a current limiting resistor to digital pin D0). The analog pins on the Spark Core are 12-bit analog to digital converters (ADC). Therefore, they measure the voltage on the pin and give it a proportional digital value from 0 to 4095 where 0 is 0V and 4095 is 3.3V. Above is the Wiring code we wrote to continuously save the digital conversion of the measured voltage on pin A4 (here called ldrpin), as a variable lightlevel. Defining the Spark.variable lightlevel in setup makes it accessible via the Spark servers. So, in this example the light level was measured by the Spark Core to be 2961 (meaning that the voltage on the pin was 3.3*(2961/4095) Volts). Instead of measuring a light level, we could have connected any other digital or analog sensors – temperature sensors for example – pre-processed the collected data on the Spark Core board to be saved as useful values which we could view from anywhere in the world. For a final test, we wrote a very short Python script on an internet connected Raspberry Pi to grab just the value of lightlevel out of the file returned by Spark and to print it out. This was saved as file core.py and run using the command sudo python core.py in the terminal. In under one second, the value of the light level measured on the Spark Core was displayed. With a slightly more complex Python script or using cron the light level could be checked every 5 minutes or other interval and logged to a file for later analysis etc. All in all, first impressions of Spark Core are very favourable. While we have previously used ethernet shields with Arduino to enable remote control and monitoring over the internet, this has necessitated messing around with broadband router settings and firewalls etc. With Spark Core everything happens automagically which makes things a lot simpler for the average user and opens up many Internet of Things possibilities. Click here to visit the Spark.io website for more information about Spark Core. 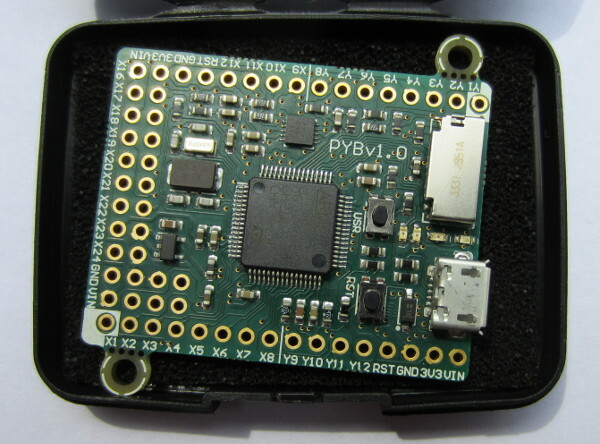 We have just received our Pyboard – a prototyping platform that runs Micropython which is an implementation of the popular Python programming lanuage. Above is the Pyboard in the hard shell padded case in which it arrived. It looks to be very well made, sturdy, and best of all, physically very small. 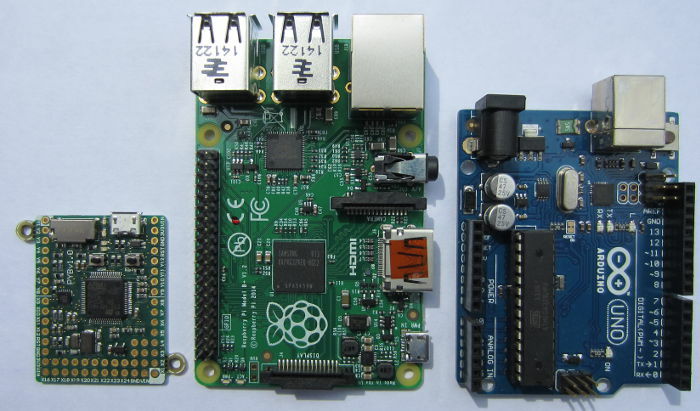 The photo above shows just how small the Pyboard is in comparison with the Raspberry Pi Model B+, and an Arduino UNO. We have lots of projects in the pipeline for which we would previously have used a Raspberry Pi, but the simplicity, size, and much lower power consumption of the Pyboard will often make it the obvious option. Pictured below is Nabduino – an “open source peer-to-peer remote access embedded board with a user modifiable web-interface developed by Nabto“. 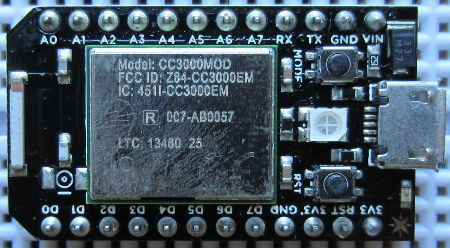 This small board (available to purchase here: buy Nabduino) can be accessed via a direct encrypted connection through a firewall without the need to change the firewall settings of your router. If for example you set up a server on a Raspberry Pi – that server will only be visible on your local network unless you change settings on your router to make it visible world wide. If your that server is not set up correctly, then your whole network is at risk – therefore this is best left to experts. Having set up that server, you then need either a static IP address (not usually free of charge) or set up some web services (sometimes free, sometimes not), so that you can find your server when you are outside the local network. The Nabduino board makes things a lot easier and safer than all that trouble. You simply connect an ethernet cable connected to your local network to the board, connect power to the board, and that is it. Each Nabduino board has a unique ID, and there is a simple web interface which gives you access to the board and its sensors etc accessible from anywhere in the world at XXXX.nabduino.net where XXXX is the ID of your board. 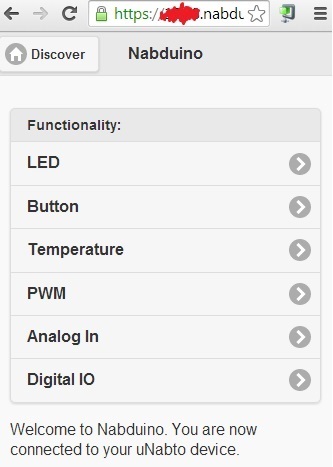 Via the simple web interface (pictured above), the state of the on board button can be viewed, an on board LED can be controlled, the temperature of the microprocessor can be monitored, five PWM outputs can be set with values from 0-255 for dimming lights or motor control, the status of six analog inputs can be viewed, and thirteen digital pins can be set to input or output and be controlled remotely. As it stands, Nabduino could be used for simple remote control of a home via relays connected to digital outputs – for example, turning on some lights when you are away from home using your mobile phone or PC. Similarly, very basic home monitoring could be achieved with sensor switches connected to digital inputs. However, much more powerful things can be achieved connecting the Nabduino to an Arduino board so that the Arduino can respond to digital and PWM signals from the Nabduino and carry out any complex logic. We will be looking at the Nabduino board in much more detail soon. Until then, click here to find out more about Nabto.com.